Singapore Airlines, one of my favorite airlines, is now offering a cash and points option when booking tickets. I probably will never book a revenue ticket on Singapore Airlines, just because I like to fly free, but this may be useful for some. Especially, if you are harboring any American Express Membership Reward points, which are transferable into KrisFlyer. Looks like the savings start at 5,000 miles and goes upward. I wanted to see how much the savings were, but I guess I can’t do it because I only have 4,500 miles in my account, so it would not show up for me. Revenue tickets on SQ are pretty pricey–a flight from SFO – Singapore will set you back around $1,500, but if you look at the breakdown, you will note almost half is fuel surcharges! Ouch! I know there were some really good credit card sign ups lately from American Express, offering as much as 75,000 Membership Reward for spending $5,000 within 3 months, and a lot of you got in on it. This could be a chance for you to use it, or you can save it up and redeem it for the Suite Life! If you are a Singapore Airlines KrisFlyer member, look for an email indicating double reward miles for flying code-shared flights with Virgin America. 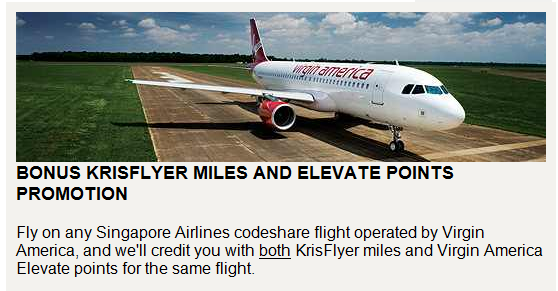 Its simple: fly any Singapore Airlines codeshare flights operated by Virgin America between now and February 28th, 2013, and get credited for the domestic leg, as well as your Virgin America Elevate points!! A great opportunity to get miles into BOTH programs for instead of one. It’s not everyday deals like this pop up. If you don’t have a KrisFlyer account, make sure to sign up for one, as both airlines are partners of American Express Membership Rewards. Virgin America recently started service from Portland (PDX) and offers non-stops to California cities. If you are interested in this offer, please visit the LINK.